It seems that everyone but Merck is satisfied with the results of the Arbiter 6-Halts study (copy in the New England Journal of Medicine). Allen Taylor of the Medstar Research Institute states that “The results are very clear, Niacin was superior.” John Kastelein of the University of Amsterdam said “I fully support” the study’s findings. Those findings are conclusive that Merck’s popular heart drugs Zetia and Vytorin, with $21 billion in sales since 2003, are not as efficient as niacin (a B vitamin) at reducing artery plaque. 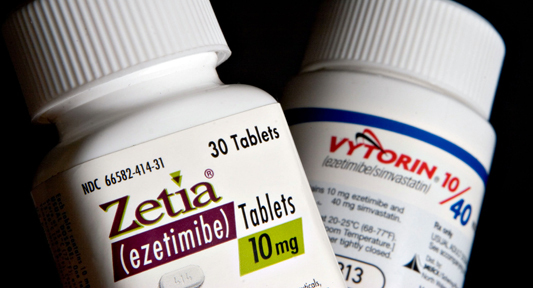 The active ingredient in Zetia and Vytorin, ezetimibe, powerfully lowers LDL (bad cholesterol). However, it appears powerless compared to prescription forms of niacin, and even Merck admits that they are unsure if their drugs prevent heart disease or death. The Enhance Trial: showed that Vytorin (which is a combination of Zetia, (ezetimibe) and a statin called simvastatin, was no better at treating clogged arteries than simvastatin alone. Arbiter 6-Halts Study: 208 people were evaluated, pitting Zteia against Abbott’s Niaspan. Niaspan reduced artery plaque by 2% (compared to no reduction by Zetia); only 2 people in Niaspan group had major cardiac events, such as heart attacks (compared to 9 in the Zetia group); and one person in the Niaspan group died (compared to 5 people in the Zetia group). The trial was stopped in 14 months because of the pronounced findings. The logical conclusion is that Zetia and Vytorin should be used only for patients who cannot reduce their cholesterol with statins and niacin. This is not a drug for everyone, and certainly not for all those people who are collectively paying Merck $21 billion for the privilege of using the drugs. Other drugs, like Lipitor, have proven effective at preventing heart attacks. But again—Merck is going to ride this out as long as they can. They have their own trial of 18,000 patients underway. That trial will end when over 5,000 volunteers suffer heart problems. Right now, there have been over 2,000 such problems. Even so, 5,000 is a very high number, and the study is not expected to end until 2011, if not later.